Weldmesh fencing is vandal resistant which offers you a strong, durable and relatively tamper proof solution. Weldmesh heavy-duty steel security fencing panels offer an extremely high resistance to vandalism. 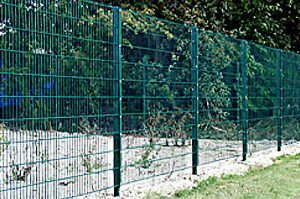 Duex 868 steel fence weldmesh panels are then fixed to strong rolled hollow section steel fence posts using stainless steel security fixings and a full-length clamp strip. Duex 868 is available 1030, 2030, 2430, 3060, 4060 and 4870mm high and a full range of single, double and sliding gates are available to match. If you require high security, vandalism proof, steel fencing security panels or high security steel gates please contact us.